The Southern Cross of Honor was a military decoration meant to honor the officers, noncommissioned officers, and privates for their valor in the armed forces of the Confederate States of America during the American Civil War. It was formally approved by the Congress of the Confederate States on October 13, 1862, and was originally intended to be on par with the Union Army's Medal of Honor. The design for the face of the medal consists of a cross with a Confederate battle flag surrounded with a laurel wreath, with the inscription "The Southern Cross of Honor." On the back of the medal is the motto of the Confederate States of America, "Deo Vindice" ([With] God [As Our] Vindicator), and the dates 1861 [and] 1865. 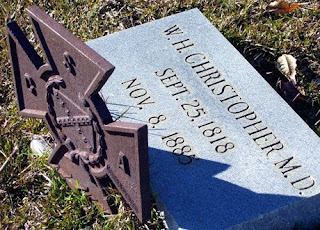 In respect to gravestones, the U.S. Veterans Administration issued Confederate stones with the Southern Cross of Honor symbol engraved at the top. It is only issued by the V.A. for graves of Confederate veterans. Another form for the Southern Cross of Honor is a cast iron reproduction of the medal described above. It is usually atop a metal rod and placed in the ground at the Confederate soldier's grave. This cross is often placed on Confederate graves by local chapters of Sons of Confederate Veterans. This form of the Southern Cross of Honor is sometimes referred to as the "Iron Cross of Honor" or "SCV Iron Cross." Douglas Keister noted in his book titled Forever Dixie: A Field Guide to Southern Cemeteries & Their Residents, that thousands of these iron crosses have been placed in cemeteries across the South. In most of the local cemeteries I've visited, however, there is often no Southern Cross of Honor found on a Confederate veteran's gravestone. Many Confederate veterans have no mention of their service on their gravestones at all. 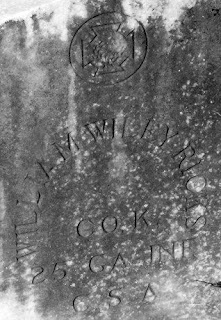 Sometimes the service is recorded on the gravestone, but it is still not accompanied by a Southern Cross of Honor. In many cases, stones recording the service of the veteran were clearly added years after his death. In slightly fewer instances, V.A. issued headstones are found. These may have the Southern Cross of Honor engraved on top, or the engraving may be of a traditional cross. In these cases, the Confederate service is recorded in varying degrees. I presume this is based on how much information is known since these stones, too, were sometimes clearly added many years after the death of the veteran. Stephanie, Thanks for continuing this discussion of the Southern Cross of Honor and for showing several examples. Many of the older Iron Cross of Honor markers have been lost to mowers, man, and vandalism and I'm always interested in seeing examples of them still in use. Mona Mills at GYRabbit of Yoknapatawpha County has a good example of a Confederate Battle flag carved on a CSA stone --- not a Southern Cross of Honor --- but a flag. Those are rarely seen too. Stephanie, I have just discovered that I did not leave a comment on this post and thank you for linking to my article on the Southern Cross of Honor! I have moved it to another site, Cemeteries with Texas Ties, since I first published it on "Covered Bridges". I thoroughly enjoyed your well researched and clearly presented article on the CSA. I look for them everywhere I go now. Again, thanks for your link to my article. Thanks for the information on the Southern Cross of Honor. I recently saw one in a Cedartown, GA. cemetery and was wondering what it meant. 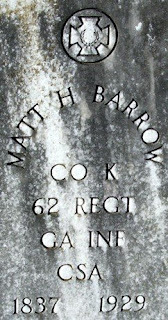 I had taken a photo of it along with my husband's g-g-grandfather who served in Co. A,1st Regiment of GA. during the Civil War. This particular cross was either enamel or painted. Would this mean that the peaceful soul beneath gave his all for the Southern Cause dying in a battle? Hi, Liz! Thanks for stopping by. To the best of my knowledge any kind of "Southern Cross" means the individual was a soldier for the Confederacy during the Civil War. It does not necessarily mean they died in battle, nor does it mean they died during the war (from disease, for example). I have a distant connection that only served for approximately two months. I don't think he ever saw a battle. He was discharged by the unit surgeon soon after enlisting because he had epilepsy. 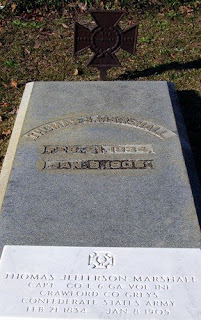 At the foot of his grave is an iron Southern Cross. 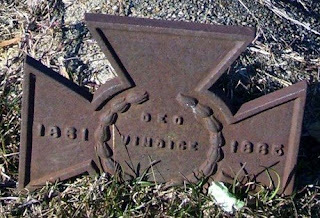 There are 2 headstones in a cemetery in Wells Maine that have the Southern Cross of Honor symbol engraved on these stones as well as the "CSA" designation. However, the units for these two soldiers are shown as being Maine Units. One, for Samuel S. Smith shows him being from the 47th Maine Inf. and the other, for Daniel Rankin shows him as being with the 8th Maine Inf. Why would these stones have the CSA and Southern Cross of Honor markings on them as well as being stones with the point at the top rather than the smooth curved style. Any clues? Wow. I'm at a loss on this one! I have never seen examples you described. If it were just one I might would pass it off as a mistake, but two... I don't know. Hopefully someone else will stumble across this conversation and provide an answer. Thank you for this valuable information. My great grandfather was a Confederacy officer. While his tombstone mentions his Company and the UCV Camp named after him, I would like to pursue placing an iron cross. What do you find the best way to place the cross? I'm thinking of some way to cement the iron rod. I have heard of cementing the iron cross, and even have seen it recommended. But I have yet to find it done in my area, so I really can't comment as to how well it would work or not. The Sons of Confederate Veterans could probably help...Thanks for stopping by! Hey! I just wish to give an enormous thumbs up for the good data you will have here on this post. I will be coming again to your weblog for extra soon. I've found two in a local cemetery. But neither are understandably close to a grave. One seems to actually replace the headstone. There is no headstone close to it. The other is almost 'tucked' next to a monument. There is one Southern Cross of Honor placed at the foot of the grave of Louisa Fowler Webb, the wife of Samuel S. Webb, a Confederate soldier and who was my great-grandfather, who died in a Howards Grove Hospital sometime in 1864. Samuel S. Webb is interred at Oakwood Cemetery near Richmond, Virginia. The cemetery where Louisa Fowler Webb is buried along with the Southern Cross of Honor is located in the Corinth Primitive Baptist Church Cemetery approximately 2 and 1/2 miles south of Lee, Florida. the information. I had no clue what it was! Thanks again. Our family church in Reynolds is older than the city cemetery. It is known as Little Vine/New Hope cemetery. In the years I was growing up there were many of these crosses on the graves but over time they just 'disappeared'. I was told as a child that they were often stolen, as were parts of the wonderful old iron fences. Thank you for posting this information! We came across an old cemetery in Sumter National Forest and found many tombstones with these markers and wondered what they meant. I'm happy to see that they were so well preserved. There was a grouping that seemed to be a family: Francis Marion Young, George W Young and George M Young. Someone had placed Confederate flags next to each of them. Makes me wonder who they were and what was their story. 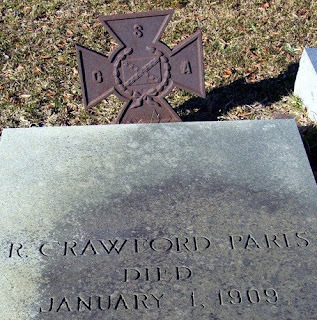 These iron crosses are placed on the graves of Confederate soldiers that served honorably. Deserters are not allowed this honor. They are usually placed by family members that are also members of the UDC (United Daughters of the Confederacy) or the SCV (Sons of Confederate Veterans). But, non members can also have it done. The family usually bears the cost of the iron cross. If you are interested in having this honor bestowed upon your Confederate ancestor and they served honorably then you need to contact your local UDC Chapter or the local SCV Camp for help. I am late to the show here... I adore your blog. I look forward to some interesting reads. Glad you're here now. Welcome! Smile for the Camera, Grandpa!